The new high wishbone layout adopted on the front suspension is the ideal solution to guarantee precise control of wheel movement, with a clearly defined steering axis in space. The architecture was borrowed from racing and endows the car with outstanding dynamic performance, and extremely sensitive, pinpoint steering. The high double wishbone already used on the Alfa 159 and Alfa Brera offers a host of technical improvements on the new vehicle. First of all, the steering axis was brought closer to the centre of the wheel, increasing the Ackerman level (to increase parallel wheel movement when steering) for better response when cornering, thanks to the steering which is the most direct in its category. 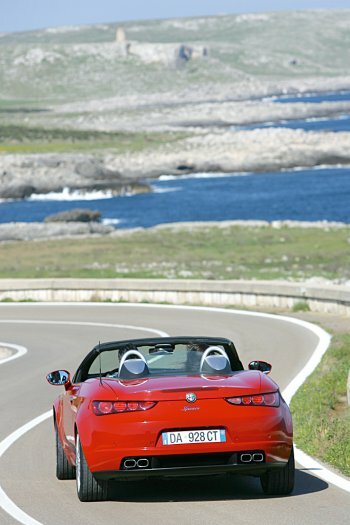 The steering of the new Alfa Spider has an excellent ratio (12.7° steer for every degree of wheel steer) for an overall rotation of 2 1/4 turns of the steering wheel, which translates into a more direct response for the driver, more responsive steering and better stability control. Painstaking analysis of the matching between steering geometry and wheelarch volume has also made it possible to achieve high steering angles even with the largest tyres, and this has significantly improved the turning circle between kerbs (10.7 metres). Great attention was paid to the new wheel upright where it connects to the levers, exploiting the available space inside the rims in full, and this has significant advantages in terms of lateral rigidity; the size of the coaxial damper spring unit with dual tube shock absorber has been increased to improve its capacity to absorb road roughness; the aluminium lower wishbone combines excellent structural characteristics and a much lower weight; the upper aluminium arm fits a pair of dry friction sliding bushes, a solution chosen because it is stronger and more reliable, and guarantees a more progressive steering action. And finally, the suspension is connected to the chassis by a closed geometry frame which is stiffer than the previous version, which featured a single crossbeam. The new Multilink rear suspension allows wheel movement to be controlled in a sophisticated manner, reaching the best possible results in terms of performance. The system with three levers and a transverse blade highlights the performance of the various components subject to longitudinal load, to improve the filtering of roughness and under a lateral load, achieving faster responses, enhanced stability and extreme grip. • A higher anchorage point for the longitudinal link, which is now positioned higher than the centre of the wheel, allowing the suspension to perform a longer, more flexible stroke, with an optimal response when negotiating an obstacle. • The aluminium upright, fitted with a third generation, extremely rigid hub, supports the connection bushes for the camber lever and the longitudinal link. • The bi-tube spring-damper unit is larger than other conventional solutions; this achieves a better compromise between handling and comfort. • The camber link, which allows the static camber to be adjusted and produces a geometry capable of guaranteeing a good camber recovery with wheel shake to ensure that the wheel rests perfectly on the road and wear is thus uniform, even when the car is pushed to the limit. • The rear hydraulic bush guarantees excellent filtering of roughness, and allows the wheel to retract slightly when negotiating an obstacle. • A high yield steel crossbeam isolated from the bodyshell by four elastic bushes that dampen high frequency vibration. 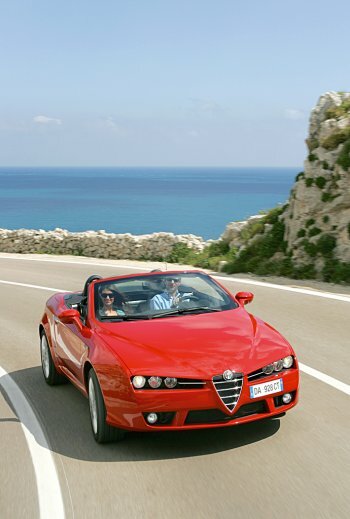 The new Alfa Spider with the powerful 3.2 V6 Q4 offers the same 4x4 system with three differentials. This takes the form of the ultra-new Twin Diff system that represents the latest development of the Torsen C. The Spider’s central differential is a Torsen C that encloses the front differential for the first time, a solution that ensures considerable benefits in terms of dimensions, weights and also performance. It exploits the forces set up by the front differential to increase its locking effect (35% during traction and 45% during release) to set up a certain self-locking effect on the front differential as well (up to 20%). The consequence of this is improved traction and cornering stability. The basic torque distribution of the Q4 system is mainly to the rear (43/57) for greater sportiness. Due to its locking effect, the central differential is able to send drive torque to the axle with the best grip on the ground moment by moment. This allows the system to switch from the initial torque distribution pattern to a distribution pattern focused on the front (72/28) or a distribution focused on the rear (22/78) in a fast, automatic and continuous manner according to the grip and slip levels of all four wheels. The Alfa Romeo Q4 four wheel drive system implements permanent, dynamic torque distribution over all four wheels to achieve the highest levels of active safety. The Q4 system is four wheel drive, Alfa Romeo style: an essentially mechanical system complemented by the most advanced electronics to assure maximum driving comfort together with optimum performance and total safety. • The Q4’s four wheel drive with advanced Torsen C self-locking differential (Twin Diff.) makes it possible to achieve improved roadholding, driving satisfaction and smooth responses. • Preferential distribution to the rear axle also adds to the driving satisfaction because it makes the car easier to handle while ensuring maximum stability when the car suddenly veers at top speed on the motorway, as can happen during emergency manoeuvres. • The ability to travel safely in poor grip conditions without the aid of electronics in torque split for constant driving satisfaction.